Inder Loves Folk Art: Some more thoughts on baby feeding. We have been practicing a modified form of "baby-led weaning" with Joe, not because we set out to do so, but because spoon-feeding him is like trying to get a cat to swallow a pill. Joe has a love/hate relationship with the spoon. Sometimes, he hates the spoon, and pushes it away with his hands, while frowning and clamping his jaw shut. Other times, he loves the spoon, and grabs it out of your hand as soon as he sees it, flinging it around and sending food everywhere (see above) before putting the handle of the spoon into his mouth. Getting (the right end of) the spoon into his mouth with food still on it? Impossible. Now, I know that all babies are different, and they become interested in solid foods at different times, yada yada yada, but you know, I'm a first-time mom, and we are capable of stressing out with extremely minimal provocation. Joe was eating considerably less solid foods at eight months than he had at six, eating time had become a bit of a struggle, and I was baffled. So finding out about "baby-led weaning" was incredibly reassuring. Here, "weaning" refers to the slow process of weaning from milk to solid foods, and does not imply weaning the child off the breast or bottle. The idea is very simple - rather than spoon-feeding your baby, just give her appropriate food and let her feed herself. If she's ready for food, she'll eat; if she doesn't eat, she's not ready, or not in the mood. No big whoop. No struggle. Of course, my mother had said pretty much this exact thing: "I never used spoons! My babies hated spoons! * I just gave you a banana, let you squish it all over yourself, and hosed you off afterward!" And no, this is not the first time one of my mother's tidbits of hippy parenting advice turned out to be the basis of an entire parenting "movement"! Note to self: Listen to your mother. Well, now that I just throw finger foods in Joe's general direction, he is eating so much more! Or maybe I'm just worrying less? Either way - it's great. I'm sold. So now I give Joe pieces of soft foods. and let him have at it. He loves baked butternut squash, baked sweet potato, cooked pasta, bananas, avocados, cooked legumes, and raw tofu. You can bake squash or sweet potato or apples, then cut them into pieces, and freeze them in a bag or Tupperware. Later, microwave them just to thaw them. Or you can offer table foods, as appropriate. This approach is much easier than pureeing your own baby food (which I have also done), and it avoids the dreaded spoon. As your baby becomes better at chewing, you can introduce harder foods like puffed grains, broccoli, and teething biscuits. Obviously, you don't give your baby tiny things that he will choke on, and you supervise him, etc. Babies do not feed themselves neatly, so you'll want to put a plastic sheet under the high chair (or utilize the services of two dogs, as we do). Also, the whole process takes a while. If I do this while making a meal or doing chores, I often find I'm more patient and have a better attitude about it. So far, so good. I have only one hang-up. I'm supposed to give Joe a spoon and let himself try to feed himself non-finger foods such as yogurt. You know, in an exploratory way. Giving him the spoon is no problem - he grabs it out of my hand anyway - but letting him feed himself? It might help if he could get the hang of putting the working end into his mouth. Until then, I'm going to be "hosing him off" a lot. The best part of feeding Joe? When he tastes something and then scrunches his face up like that was the most disgusting food ever - he had no idea anything could be so gross! - and then promptly shovels more into his mouth, like he needs to taste it again just to make sure it's totally vile. This never gets old. * Not all babies hate spoons, but hating spoons apparently runs in my family. Along with not sleeping through the night until adolescence. i can't believe that ours is eating from a spoon, generally, pretty well. much better than at first. it's bizarre! of course, it works best when it's banana or apple. a bit touchier when it's just the baby oatmeal. hey, are people really reccing that a freakin 8-9 month old feed himself with a spoon? that's crazytown! Yeah, the websites say that young babies can, at least sometimes, figure out how to feed themselves with a spoon. I don't think it's the spoon that worries me so much as the bowl, though! What a mess! 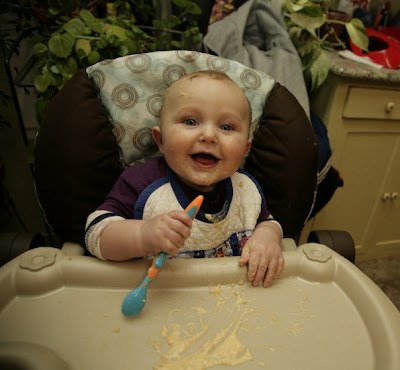 I waited until six months to introduce solids! It's just that Joe wasn't actually interested in solids until, like, two weeks ago (that would be 8.5 months, folks). Meanwhile, his little baby friends were putting away three large meals a day! But yeah, that's what I like about the whole BLW approach - it's actually low stress, low worry parenting at its best, but with a name and a bunch of websites associated with it to make you feel like you are actually following some kind of recognized "method." My kind of mothering! I'm so glad to meet another mother of an adorable roly-poly baby who is taking his sweet time with solids! I'm glad you've found that a laid-back approach is working better for you, too. Spoons just were not happening with our kid, either. I agree, though, with what are the hard parts of BLW: (1) Not stressing that other kids are eating so much more whereas yours is using yogurt simply as some sort of a facial and cucumber sticks as chew toys. (2) Cleaning it all up! So nice to see you here, Ms. Lauren HoboMama - I'm a huge fan of your blog!! Hey...saw a link to this post on Hobo Mama's blog. We did/are doing BLW with our son. We started with purees, but his interest in mush died out pretty quick. I love BLW and will try it first with the next kid. He's 20 months old now, and eats a good variety but still needs milk, which I'm pretty sure is totally normal. Oh, and he handled a fork at 9 months old, but I didn't give him a spoon till he was a year old...I think it's just easier to stab food than to scoop it. Fascinating! May have to try giving Joe a fork.